Despite a few murders and a vengeful ghost, Killing in C Sharp is a delightfully fun and entertaining read. 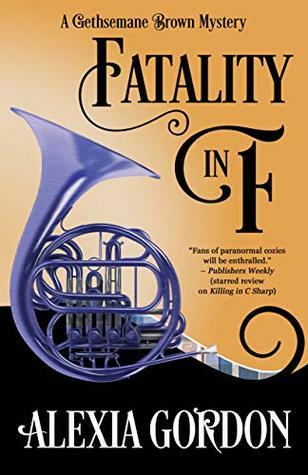 I found this to be a light-hearted paranormal novel, and I applaud the author for the absence of any gratuitous blood and spooky stuff. There is just enough blood and just enough spooky stuff to tell the story, and that was quite satisfying to me. Where would a light-hearted paranormal novel be without quirky characters? The cast of this tale does not disappoint. Gethsemane Brown hails from the US, but now teaches music at a quaint Irish academy. Under ordinary circumstances, she would likely be pretty ordinary, but put her in a house with a ghost she befriends, and give her the reputation of people being murdered whenever she shows up, and the result is a wonderful character that anyone would enjoy spending time with. Eamon, Gethsemane’s ghost of a friend, meshes with her very nicely. They are both protective of each other, and when one or the other falls into harm’s way, the other is quick to act! This devoted friendship fans the flames of literary conflict and pulls the reader right into the story. The remainder of the cast includes a local police inspector, some unscrupulous writers, and a whole television crew determined to show the world that ghosts really do exist. All of the characters are gleefully flawed, and some of the backstories are very original. I can’t imagine this story being so good if any one of them was omitted. There were no SPAG issues worth mentioning. The pace moved along nicely. I thought the character arcs were somewhat unique in that they didn’t go where I thought they would. But that’s a good thing. Posted: March 22, 2018 March 22, 2018 . Posted in: Book Adverts, LSBBT. Tagged: AfricanAmerican, amateursleuth, cozy, diverse, femalesleuth, Ireland, LoneStarLit, LSBBT, Mystery, paranormal. Bookmark the permalink. Great review! I felt the same way at the end! Up, down, up! Can’t wait for book four!